Fresh Long Island bay scallops (we call them jewels of the bay) are probably the most delicious things we Long Islanders have the privilege of dining on. The mere mention of them will stop conversations dead in their tracks and make eyes light up all over the room. If you’re an aficionado then you know what I’m talking about. If you’re wondering what all this fuss is for, then you’ve probably never tasted them. Oh, I’m sure you’ve had scallops before, but they were probably fried, button sized balls of meat imported from who-knows-where. Once you’ve had fresh Long Island bay scallops, also known as Peconic Bay scallops, you’ll never eat those other things again. Scallops have been scarce on Long Island ever since an algae bloom (brown tide) severely damaged the population in 1985. Several blooms since have further damaged recovering populations. Presently, the scallop harvest is erratic at best with good years and bad years. But even the good years are not as good as they used to be. You may wonder why, if the scallops are in so much trouble, they are harvested at all. Well, interesting thing about scallops is that they only live about 2 years. Scallops are born during the summer and spend their first year growing. Then in the summer of their second year they spawn. The scallops are harvested in the fall and winter after they’ve spawned and reached the end of their life cycle. Since they're going to die soon anyway, there's no harm in taking them. 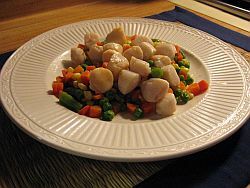 Many Long Island fish markets carry 2 kinds of scallops; Bay Scallops and Peconic Bay scallops. If you walk into a fish market and ask for bay scallops you're going to get scallops from Maine, the Carolinas, probably other coastal areas as well. Generally these are about 1/2 to 1/3 the price of Peconic Bay scallops. The downside to imported scallops is that you don't know how old they are, how they were handled during shipment, or if they were treated with sodium tripolyphosphate (STP). 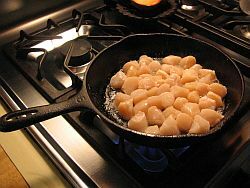 STP is a safe food additive that is used to prevent scallops from drying out. It can also be used to increase the weight of the scallops (and price you pay) by causing them to absorb excess water. If the scallops look artificially white, are extra large or falling apart, and/or have a lot of milky looking liquid oozing out of them, then they've been over-treated with STP. Don't buy them. Scallops that have been over-treated with STP cost more per pound due to this excess water. They won't brown when you sear them and just don't taste right. However, if they look good, chances are they are good. Buy them and enjoy. Expect to pay between $9 and $11/lb. 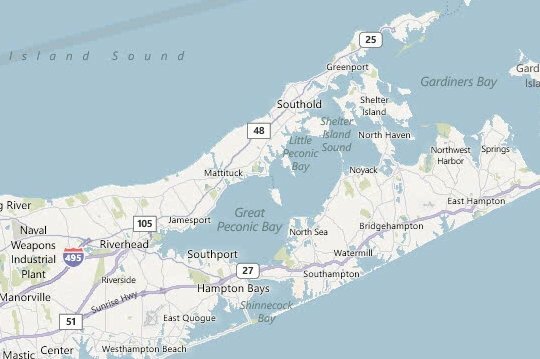 These are harvested on Long Island from the first Monday in November until March 31st and come from the waters between Long Island's North and South forks. Because they are local they're sure to be fresh and won't be treated with STP. The Great and Little Peconic Bays are Long Island's primary source of scallops. 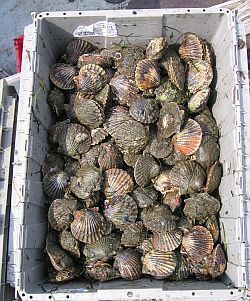 Peconic Bay scallops are readily available in November and December at most Long Island fish markets however, they start to become scarce after the 1st of the year in fish markets west of Riverhead. If you're looking for them in February you'll find them, but it would be a good idea to let your fingers do the walking. Expect to pay $19 to $22/lb. in East End markets close to the bay, $28 to $32/lb. in Nassau County. These are current 2012 prices. Bay scallops are what most people picture when they think of a scallop. They’re between 2 and 3 inches wide and have those beautiful fluted shells. Sea scallops live in much larger, saucer sized shells that are very flat and don’t have flutes. There are differences in flavor and texture too. Sea scallops are quite good, but the bay scallops are just a little more tender and lighter in flavor. Both are excellent raw. By the way, many people are under the false impression that sea scallops are punched from skate wings. This is simply not true. A sea scallop is a real living creature just like a bay scallop. I’ve heard of dishonest mongers trying to sell punched skate wings as sea scallops, but I’ve never seen this myself, and I don’t think it’s anything to worry about. Sea scallops are plentiful enough that there’s no reason to try and fool people. Long Island bay scallops along with clams, oysters, mussels and lobster have been a staple of our coastal diet since before Long Island had a name. Left: Tossing a dredge overboard for the first tow of the day. Once plentiful in Long Island’s bays and estuaries, bay scallops were easily harvested in shallow water making them a reliable, convenient, and delicious source of protein. But today their scarcity makes them more of a delicacy than a staple and Long Island’s baymen have to work extra hard for even a small catch. It’s no surprise then that Long Island bay scallops are expensive, fetching $19 or more a pound (2012 prices) for shucked scallops. The season runs from November through March. These cold winter months present brutal working conditions for the baymen, but are ideal for keeping the shellfish cool until they can be properly refrigerated. The harvesting process is simple. 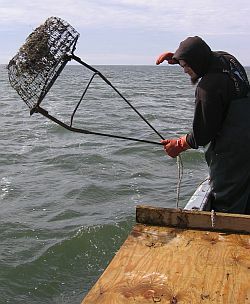 Small iron dredges are dragged along the bottom scooping up the scallops. Every few minutes the dredges are hauled in and the scallops are picked out. Everything that’s not a scallop is thrown back. This is back breaking, monotonous work. On a typical day a baymen working alone will bring in 3 to 5 bushels. Here’s a short video I made of my son harvesting scallops from his boat on Long Island's Great South Bay. Opening is very easy, much easier than opening clams or oysters. Hold the scallop in the palm of your hand with dark or dirty side of the scallop up and the hinge side toward you. Insert the knife in the opening on the side of the scallop and twist the knife upwards to cut the muscle near the top of the shell. Pull the shell open, scrape out the guts and you will be left with a beautiful scallop meat. Watch the video to see how it’s done. Scallops can be cooked and eaten many different ways. One of my favorites is to eat them raw as I’m shucking them. Scallops are actually one of the safest shellfish you can eat this way. Because only the muscle is consumed there is little chance of ingesting illness causing bacteria from the guts (viscera). Having said that, note that the entire scallop, viscera and all is edible and the risk of illness is the same as any other shellfish—very, very slight. Left: I love my cast iron frying pan. Get it nice and hot and toss those scallops around until they're just done. When cooking bay scallops or any other fish for that matter you want to make sure you don’t overcook. That will make your scallops tough and unappetizing. Bay scallops have a very sweet, delicate flavor that stands alone yet is easily overpowered, so I’m not a big fan of over seasoning, or using fancy sauces, or any of that other stuff the gourmet cooks like to do. Typically I’ll just throw some butter in a frying pan with a little olive oil to keep it from burning and sauté the scallops for about 5 minutes or so. Remember, you don’t have to fully cook them and you definitely don’t want to overcook them. Ideally, you’ll get the scallops out of the pan while they’re still a little raw on the inside. Serve over steamed vegetables and you’ve got a real Long Island delicacy on your plate. Right: Scallops over steamed vegetables. Simple, delicious, nutritious, and easy to prepare. The viscera take longer to cook than the meats, so I cook them separately. Shake them around in a zip-lock bag with some flour to give them a little coating. Drop them into a hot frying pan and remove when nice and brown. If you’re interested in how seafood finds it’s way to your plate, I highly recommend Peter Matthiessen’s book, Men’s Lives: The Surfmen and Baymen of the South Fork.